This week, we are reminded that the right action, taken with the right intentions and in the right timing, will yield positive results. Also, be mindful whom you take advice from. Let’s check out this week’s reading! LEFT: TWO OF SWORDS REVERSED. This is one of the cards in the Tarot that I prefer to see reversed! Upside-down, the Two of Swords indicates that a time of indecision and confusion is coming to an end. Soon, the clarity and information you require will arrive, and you’ll be able to make wise decisions about a situation you’re facing. Till then, don’t rush it, and certainly don’t give in to pressure to force any developments. MIDDLE: THE DEVIL REVERSED. Another card I’m happy to see reversed! The reversed Devil also represents an ending or weakening of something that oppressed you and/or held you back from achieving your full potential in some way. This could be an inner fear, an actual person, or an external factor. Whatever it is, when the Devil is reversed, you can defeat this oppressor quite easily. RIGHT: SEVEN OF WANDS. The card of self-assertion appears for us here, and clearly indicates that standing our ground will be key to overcoming the obstacles that hold us back from our desired outcomes. While it’s clear what we need to do in order to achieve what we desire, you’ll notice this spread doesn’t specifically mention when – it only highlights the condition that must arise in order for this self-assertion to occur (i.e. the end of indecision, as indicated by the reversed Two of Swords). Until you reach that point of mental clarity, lie low and take no action. Fools rush in where angels fear to tread. Don’t be one of them. Don’t be complacent about your current state. Truly, you are neither in danger nor at peace. Only a fool cuts his flesh to patch a wound. Is it not wiser to await a favourable time? Lot 65 is a 下签 (“lower lot”) which, traditionally, portends misfortune and warns against negative karma. But don’t be afraid of them! In my experience with the Goddess Guan Yin, I have learnt that She issues 下签 only to protect us against dangers we cannot foresee. As our Divine Mother of perfect Love and Light, Guan Yin only wants the best for us! If we imperfect humans try to warn our family and friends against unwise actions, all the more the Goddess would do this. I have heard of people who received 下签 and went against the Goddess’s warning, at their great cost. To these people I say: the Goddess didn’t curse you. Your ego brought misfortune upon yourself. Do not fear the divination lots. Beware the darkness in your own heart! When this lot appears, be reminded that true wisdom is knowing when to move forward, when to be discreet, and when to stop. Weigh your options wisely: doing nothing for the moment may benefit you more than charging forward now, and fixing even more problems later. Only a fool cuts his own flesh to patch a wound. 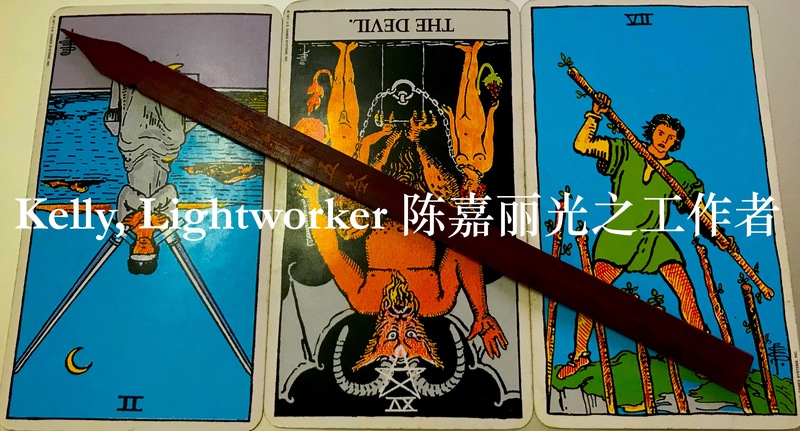 This week’s divination lot warns us to watch out for 小人: what the Chinese call “small people”, a term referring to petty villains, fools, and saboteurs. 小人 are an interesting study in the psychology of failure and denial. Their lives are walking disasters, but they think they’re always right, and the Universe somehow revolves around them (must be nice to be that delusional). They also love giving advice – it’s a way of deflecting attention from their own crappy life choices. You’ll notice that the advice of a 小人 tends to reflect their values: small-minded, egoistic, irrational, and spiteful. Pettiness and stupidity are the way of life for such people, and they receive massive amounts of negative karma in return – but they don’t learn. This week, some 小人 may come up to you and give you ‘advice’ which is about as useful as cutting off your nose to spite your face. Their true intentions are malicious: they want you to make stupid life choices, just like they do, so they can gloat over your suffering. Ignore them. Heed the words of the Goddess, Noble One, and do not disobey the voice of She Who loves you unconditionally. Hold back, lie low, and bide your time. A more favourable season will arrive for you, where beneficial decisions can and will be made. When that happens, you’ll need to be strong and to assert yourself. But that is a battle for another day. When it is time, the Goddess will let you know. Btw, have you checked out my reading for the month of February 2019 yet? CLICK HERE for the TAO of Kelly, February 2019, where I suss out the month’s energies so you can make the best choices for your life, moving forward!